Wake up your steak, chicken or salmon! Apply liberally to coat all the sides and lock in the juices. Sprinkle as a seasoning on salads and vegetables, add to your olive oil and vinegar marinade, or mix with olive oil for a bread dipping oil. Rub on meats before grilling or baking and optionally finish with our BBQ Slather. The combination is out of this world on ribs! Mix 'N mayonnaise to for a sandwich or hamburger spread. Classic sweet, hot and tangy Caribbean Jerk. Rub directly on meat or seafood. Mix 'n some of our EVOO for a marinade. Espresso Mix 'N Rub contains ground espresso, brown sugar, sea salt, spices, pepper. Mediterranean Mix 'N Rub contains dried herbs, sea salt, pepper. Smoky BBQ Mix 'N Rub contains spices, brown sugar, sea salt, pepper. 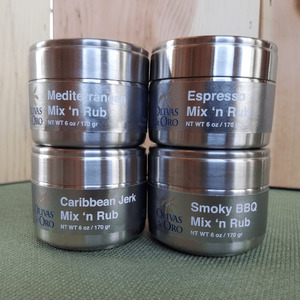 Caribbean Jerk Mix 'N Rub contains spices, red pepper seeds, dried habanero, sea salt.